Driving a car can be a lot of fun, but it can also be a bit of a hassle. Whether you’re stuck in traffic, or can’t find anything good on the radio, there are a number of things that can sour a driving experience. However, they all pale in comparison to driving in a seat that is uncomfortable. No matter how much you love cars (and we really, really love cars, even racing around with RC cars), an uncomfortable seat can ruin the entire experience of being behind the wheel. It doesn’t matter if you’re commuting, or out or a weekend spin, an uncomfortable seat has the potential to make you miserable. And if you’re going on a long road trip? Forget about it! Your back will never forgive you if you spend eight hours a day with a rigid, poorly-designed seat. If the VIKTOR JURGEN model looks intense, it’s because, well, it is. 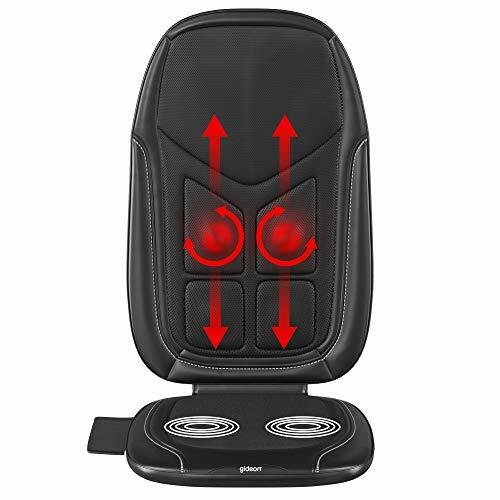 This car seat vibrating massager has numerous vibrators, and myriad settings, to help you find the setting that is most comfortable for you. With motors in the upper back, lower back, and thigh regions, this model can really cover a lot of ground, and help make your body comfortable. While the VIKTOR JURGEN 6-Motor massager is great for comprehensive massages, we found it really shined at massaging specific parts of the body. With six different modes to choose from, this model can focus specifically on your upper back, mid-back, lower back, or thighs, among other options. In our experience, if you’re trying to keep a specific part of your body loose while driving, you won’t find a better massager than this one. Perhaps the most interesting thing about this car seat massager is that it utilizes 10 magnets to help provide a gentle, balanced heated element. We were really happy with the result: the heat level is comforting and comprehensive, but not overwhelming or abrasive. We also loved the remote control, which makes it really easy to circulate between the different settings, and find the right one for you. While this car seat massager isn’t flawless, we really loved it, and it does well at just about everything. 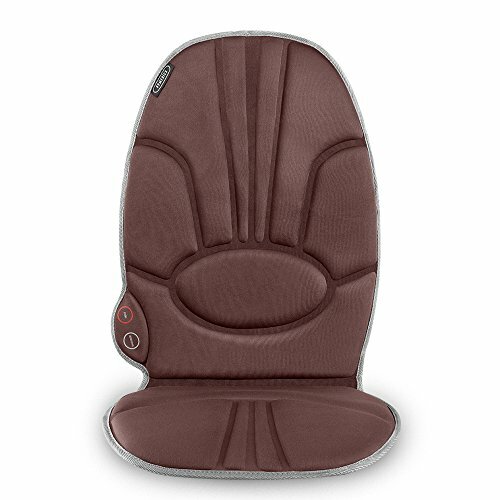 This Homedics car seat massager is one of the most simple and affordable car massagers available. Yet simple can be great, and, depending on what you want out of a car seat massager, we found this model could be wonderful. The important part of the Homedics model is that it’s not designed for long trips. This car seat massager is very thin; it doesn’t provide much, if any support for your back or neck. However, the massaging (which can fluctuate between high and low settings) is very comfortable, and the light heat is incredibly soothing. We found that this was one of our favorite vibrating massage car seats for short rides, when we just wanted the luxury of an in-car masseuse. Since the Homedics model is so small and lightweight, it’s also incredibly easy to transport it to and from your car, so that you can use it inside the home as well. Ultimately, if you’re looking for a basic car seat massager to make you comfortable on short trips, you can’t go wrong with this. The Gideon model is the most expensive car seat vibrating massager on this list, by quite a bit. However, we’re firm believers in you get what you pay for, and the Gideon Luxury Six-Program Customizable Massaging Cushion is the epitome of that mantra. We’ve tried a lot of car seat massagers, and we’ve never found one that covers the entire back as effectively and therapeutically as the Gideon model does. The model features four shiatsu massaging nodes that move up and down to cover your whole back. Or, if you have a specific knot that’s bothering you, you can use the arrows on the unit’s remote control to direct the massaging to a certain spot. Honestly, when we tried this feature, it was almost as good as paying for a massage! The massaging balls on the Gideon car seat massager are designed to replicate the feeling of a masseuse’s hands, and replicate it they do. Especially in rolling massage mode, this model feels less and less like a car seat massager, and more and more like a pair of hands. Ultimately, our opinion of the Gideon massager boils down to this: it’s pretty common for us to stay in the car for an extra five minutes after we get to our location. It’s that good. And if it’s in your budget, we have no doubt whatsoever that you’ll fall in love with this shiatsu car seat massager. The Zyllion car seat massager is one of the best small units on the market. At only 13 inches wide, and 9.5 inches high, this model is designed to be placed over a specific area. And we found that whether that area is lumbar, shoulders, or neck, the Zyllion Shiatsu Pillow Massager is equipped to massage it. Our favorite thing about the Zyllion model is that, even though it only has one setting, it is both comforting, and therapeutic. When we had a knot, the Zyllion seat massager helped get rid of it. When we were feeling good already, the Zyllion massager felt simply luxurious and comfortable. Whatever the need, we had great results with this model. The downside of the Zyllion Shiatsu Pillow Massager is that, because it’s small, you can only address one area of your body at a time. If you’re on a long road trip, you might favor a car seat massager that covers your whole back and neck. However, the four three-dimensional shiatsu massaging nodes used in this model accomplish their goal brilliantly, and we loved this model. The included straps also allow you to easily connect the massager to the seat or the headrest, to keep it in the right place while you’re driving. Ultimately, the Zyllion model isn’t the most versatile car seat massager, but for what it does, we couldn’t ask for a better product. This one is definitely staying in our car. 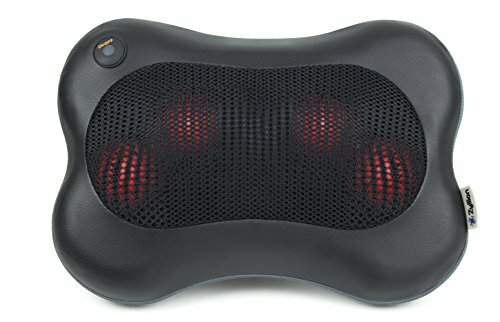 The Nekteck massager may have a unique shape, but don’t let that fool you: this model is exceptional. The unconventional U-shape allows the Nekteck Shiatsu Deep Kneading Massage Pillow to incorporate eight shiatsu massage nodes, to cover a large area. While the shape is certainly odd, we found that it allows this car seat massager to do things that other massagers can’t. You can drape the massager around your neck, and down your shoulders, or you can wrap it around your back and chest. Passengers, or people using the Nekteck model in the home, can wrap it around their thighs or calves. 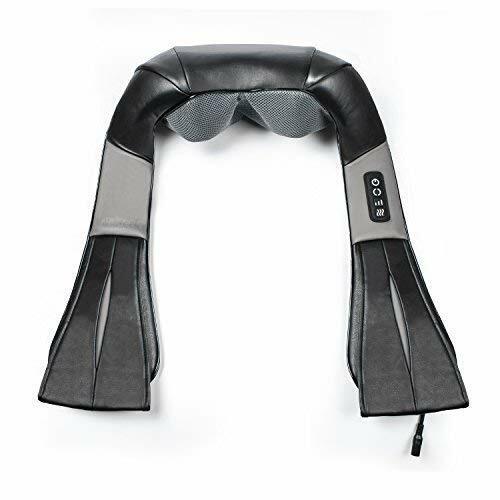 The design allows the Nekteck massager to cover an entire region by wrapping around the body; this isn’t what everyone wants, but we sure loved it. We tried to find something to critique about this model but . . . we really couldn’t. And given the Nekteck’s near flawless reviews, apparently we’re not the only ones. This isn’t the model for everyone: the shape means it’s designed for massaging, not for support or cushion, and it’s a bit pricier than most models. But, again: we have nothing bad to say about this car seat massager. The 1 byone car seat massager is another small unit, but it packs a lot of punch, and is one of the top shiatsu car seat massagers available. This model utilizes four shiatsu balls that perfectly cradle the neck, shoulder blades, or back. With rotating directional pressure and a light amount of heat, the 1 byone massager is pretty blissful, and definitely one we never wanted to turn off. This model is also incredibly easy to use, partly because you can’t adjust it at all. It has a simple on/off switch, and will automatically power off after 20 minutes (but don’t worry: you can turn it right back on!). But the shining star is the four shiatsu balls, which provide some of the best massaging that we have experienced from a car seat massager. This is one that we definitely brought in the house after using it in the car. 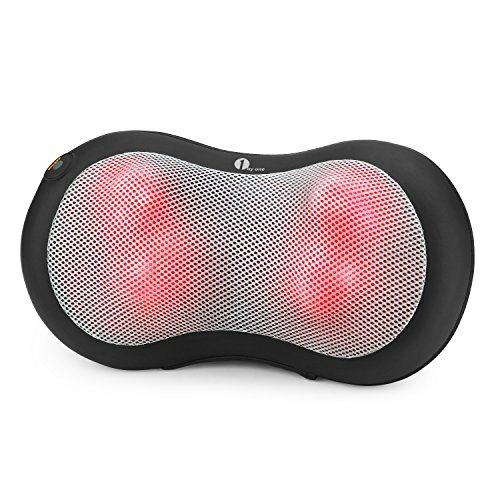 The 1byone Shiatsu Massage Pillow Massager is small, and intended to focus on a single area. There are downsides to that, of course, but if that’s what you’re looking for in a car seat massager, this is as close to perfect as you’ll get. There are a lot of factors to take into consideration before purchasing a car seat massager. While we adore all six of the massagers on this list, they’re all very unique. We’re confident that at least one of the models listed above is the right fit for you, but it’s unlikely that they all are. Before buying a car seat massager, consider what you’re planning to use it for. Do you commute daily, and just want something to make your traveling a little bit more comfortable? Do you go on long road trips and want to add a little luxury and cushion to your seat? Or do you have some back or neck problems that you want to address while you’re stuck in traffic? Considering what you intend to use your seat massager for can help you find the model that’s perfect for you. Of course, features, specifics, reviews, and price always play a factor in a consumer decision. A car seat massager can be the difference between a miserable driving experience, and a luxurious one. As long as you find the massager that perfectly fits your needs, you can end up dramatically improving the comfort of your driving experience. We loved all six of the models listed above, and we’re pretty certain that you will, too. Happy driving, and just as importantly, comfy driving!